Do you miss virtual share? I sure don't, but some teachers miss the ease at which students could quickly upload completed assignments to a teacher's virtual share drop box. Fellow ITRT Michael Price developed a script that will allow students to anonymously upload files directly to a folder in your Google Drive. No sign in necessary! Students just need to visit the website, enter their name, choose the file, and click on the upload button. This script also works on iPads running iOS 8 and above. Here are 2 examples of what it looks like. 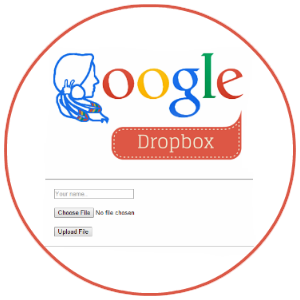 Below is a Screencast tutorial that will walk you through the process of copying and editing the script to create your very own Google dropbox.